I have all kinds of keys – house keys, car keys, safe keys, and more. Their common characteristic is that they open things that cannot be accessed without them. 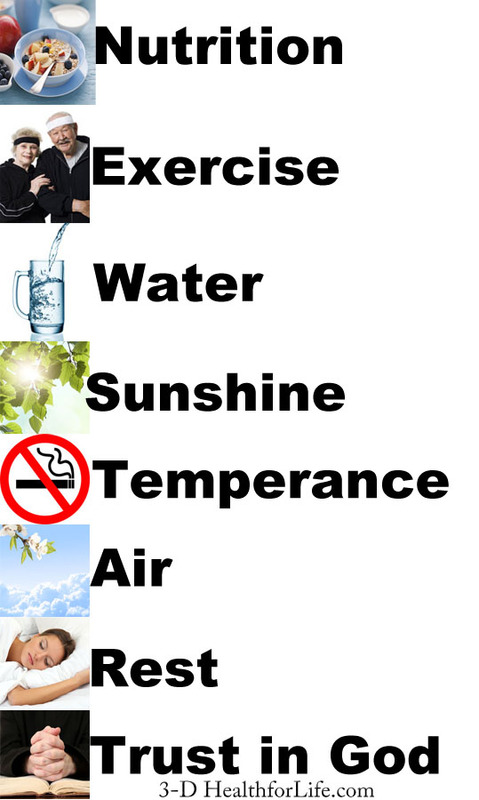 So it is with these 8 keys to your best health. Each one provides opportunities for you to build habits of life that will serve you well, not just for today, but for the rest of your life. Best of all, they can be implemented by you, whether you are rich, or poor, or in-between. To help me remember these 8 keys to experience optimal health and wellnes, I use the acronym NEWSTART. Here is a brief description of each key followed by an ACTION STEP you can take to put yourself on the path to Your Best Health. 1 – Nutrition. Proper nutrition and habits related to eating have a huge impact on your health and your own choices hold the key to implementing and enjoying these benefits. Much research in recent decades has pointed to the fact that a mostly plant-based diet or total vegetarianism provides a strong foundation for the prevention and reversal of many diseases, including the one that kill most Americans and those that follow that general lifestyle around the world. Diabetes, Heart Disease, High blood pressure and Stress are all directly affected by our food choices. The Physicians’ Committee for Responsible Medicine just compiled a list of ways in which nutrition choices directly affect cancer risk. You can read the whole article here. Stay tuned for more blog posts on how to make this really practical. 2. Exercise. Everyone knows that exercise is essential to health, but what kind and how much? Our busy lives often provide big obstacles to actually implementing regular exercise. Intentionality has to be part of our toolkit to actually carry this out. Remember, if you don’t use it, you will lose it and muscle is a prime example. Muscle is much denser than fat, so the good news is that building muscle will help to move you toward your ideal weight (whether you are under or overweight) and will provide many trimming benefits if you are above your ideal weight. Studies show that exercise, even at home in an informal setting, significantly improved the quality of life for the elderly that suffered from osteoporosis. Better yet, if started early in life, the positive effects can continue well into the later years. And it’s never to late to start! 3. Water. This humble fluid has been greatly neglected in much of our society today. There is nothing so well-designed to meet the needs of the body for hydration, organ function, and optimal circulation as pure, soft water. No other beverage can take its place when you are on the path to best health. Its use externally is equally powerful. Bathing and a great variety of treatments utilizing the unique properties of water in its various forms (liquid, vapor, solid) can be literally lifesaving. 4. Sunshine. Much maligned due to fear of skin cancer, our society now finds itself in the position of more often suffering from a lack of sunshine than an overabundance. Sunshine is vitally important to the proper functioning of brain chemicals and a variety of hormones in the body. Its proper use can alleviate depression, improve mood, and even protect from various cancers. 5. Temperance/Self-Control. The ability to use those things which are health-producing (good food, etc.) in moderation and to completely abstain from those things which are harmful to the best health is the hallmark of true temperance and requires self-control. Thus this key to health relates to all others as well. 6. Air. Fresh air is a priceless gift. It truly is the stuff of life, as we would very quickly perish without it. But even when surrounded by large quantities of fresh air, our behaviors can take more or less advantage of it. For example, proper posture and breathing habits greatly improve our body’s internal oxygen levels, while failing to open the windows of our homes and provide adequate circulation of fresh air can keep us from enjoying the precious benefits of fresh air. 7. Rest. In our every increasing busy-ness, sleep often suffers. To really get the benefit of this key to health there are a number of simple activities that can greatly increase our benefit of the hours spent in rest. We will go into them in greater detail in a future post. Adequate rest has a direct impact on our moods, brain function, decision-making ability and memory. When we rest as well as how much we rest are both important factors in our health. 8. Trust in God/Stress Control. Our ability to respond in a healthy manner to the situations we face in our daily lives have an incredibly important impact on physical, emotional, and spiritual health. This key is essential to the implementing of each of the previous 7 keys. Without the support of an external higher power in our lives, we can never experience the depth of peace and joy that are foundational to truly productive and high-quality lives. There is such a powerful link between our mental state, our thought patterns and what we experience both physically and emotionally, that this key must be integrated into our daily life to truly experience Total Health and Wellness. Stay tuned for future posts that will go into each of the keys in greater depth, bring you cutting-edge science to support them, and share how you can practically implement each of these areas into your life. Action Step for Today – Click here to go the 3-D Health Facebook page and “like” the page. It is regularly updated with articles and research that can be a great resource for you.